Not a lot of prose in this post. I’ll just share some stunning numbers. Such as, 400,000 immigrants served in the Union Army. The foreign-born population doubled between 1850 and 1860, with most of the newcomers from outside the British Isles. What did this mean? Well . . .
1/3rd of the first generation immigrants here before the Civil War were German. Milwaukee and Cincinnati (sometimes called “Over the Rhine”) were half German. 47% of the population of New York City was foreign born. 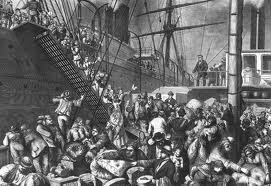 In 1860, the only southern state with a large immigrant population was Louisiana with 11 percent. South Carolina had 2 percent foreign-born and Georgia had 1 percent. Overall, 3.6 million foreign-born lived in the North and 400,000 lived in the South. Naturally, there was push-back and hostility in many areas, but in an expanding economy, and especially when the Civil War created a desperate need for fighting men, nobody talked about building walls. It’s good to hold these figures in mind, I think, when looking at today’s immigrant situation.